Woodz Modular Kitchen designs and Wardrobe designs in Hyderabad, Guntur, Amaravathi, Vijayawada and Visakhapatnam will bring more elegant and fresh outlook for your entire home. Woodz - is a professionally managed organization Owning its Innovative Ideas, Customized Designs, its Concepts and its Trade-marks with its own Manufacturing Facility. 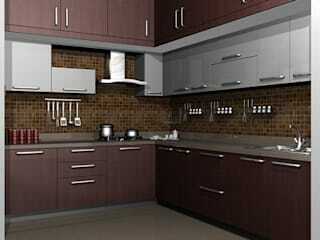 Woodz deals in Modular Kitchens, Wardrobes Furniture, Crockery Units, T.V. Show Cases, Office Furniture, Kitchen Accessories, Baskets, Hardware etc. L-shaped kitchen engages two side of the wall leaving other sides free to be explored. 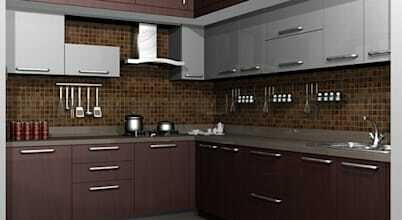 In modern homes we usually prefer to have an open kitchen integrated with the dining and living rooms of the house. Keeping kitchens organized is easier said than done, especially in Indian kitchens where innumerable bottles of spices and different types of pots and pans spill over from designated cabinet space and clutter the countertops.